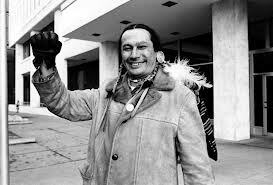 In Tribute To Russell Means Whose Spirit Shall Never Die! It is through boundless tears of enormous sorrow and simultaneously, with a renewed sense of determination that my column is written today. My sisters and brothers, another people’s warrior has transitioned on to be nestled by the spirit of our precious Mother Earth in her strong, gentle and welcoming bosom. On Monday morning, October 22, 2012, Russell Means, our Indigenous Native warrior, passed on from his physical existence, leaving us a stalwart and exemplary legacy of unrelenting struggle and courage in the face of an increasingly avaricious, vampiric, and hypocritical U.S. Empire. [Reference: republished in the, ‘Russell Means Freedom’ site, To Be Black and Head of the U.S. Empire-A Contradiction in Terms]. Our dear brother Russell has now joined with so many others of our heroes and sheroes including Crazy Horse, Nat Turner, John Brown, Harriet Tubman, Emiliano Zapata, Joe Hill, Rosa Luxemburg, Malcolm X, Fannie Lou Hamer, Steve Biko, Bobby Sands, Marilyn Buck, Geronimo Ji-Jaga Pratt, and countless others. He stands with and among them now – proud and free! 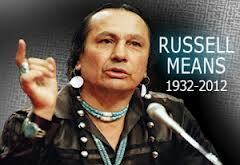 Russell Means is perhaps best known as having been one of the leaders of the American Indian Movement (AIM). While Russell was indeed that, he was also so very much more. Russell never ceased to point out the chauvinism and arrogance of this nation, which fails to pay heed to the destructive seeds of its own internal and external hypocrisy. His ‘Russell Means Freedom’ and ‘Republic Of Lakotah’ web sites constantly sounded the alarm in this regard. While sometimes scorned by the U.S. corporate-stream media, he nevertheless, did not miss a beat in exposing and demanding an end to U.S. hypocrisy and the exploitation and oppression of Indigenous Native peoples and all oppressed peoples. He tirelessly sought to raise the consciousness of the people – to get them / us to remember our roots and never lose sight of how valuable these roots are to this very day. 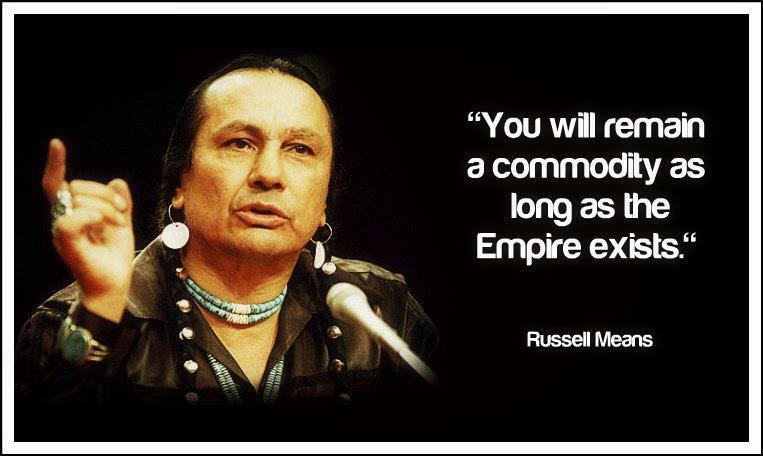 Russell Means was both a doer and a visionary. Our brother, Russell Means, belongs to all of us who love freedom and justice – Red, Black, White, Brown, and Yellow people – all of us! We shall hold on tightly to his spirit, and in so doing, we shall remember our many political prisoners of all colors (including Leonard Peltier, Mumia Abu-Jamal, and Lynne Stewart), in this nation and throughout Mother Earth. We shall intensify and carry on in the just and necessary struggle of everyday people, from here to Palestine, to Haiti, to Asia, to Africa, and yes, to Europe, and indeed throughout this planet. In the words of Black Panther Party veteran, Kiilu Nyasha, “Long Live The Spirit of Russell Means!” Do not doubt this, for the spirit of Russell Means shall never die!